Just a single malfunctioning or improperly installed faucet in your bathroom or kitchen could result in the loss of hundreds, if not thousands, of gallons of water. Losing that much water would unnecessarily increase your water bill. Fixing a broken or malfunctioning faucet is vital to preventing waste. It not only helps you decrease your water bills, but it can help you eliminate the possibility of extra repair bills that may result from damage caused by the leaking or broken faucet. Homeowners or renters living in the Tarrant County area can call upon the expertise and experience of HEB Plumbing & Sprinkler-Kathlyn Smith. HEB Plumbing & Sprinkler, located in Bedford, TX, provides high-quality plumbing services that include kitchen and bathroom faucet installation, repair, or replacement. 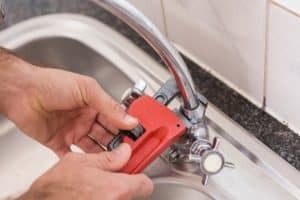 Whether you need a new faucet installed in a remodeled bathroom or the kitchen sink has started to leak, our professional plumbers will be there to help you. There is no way to 100% guarantee that a faucet will not break, but proper installation of kitchen and bathroom faucets will decrease your chances of having a faulty or broken faucet. We can assist with the installation process and will be there from start to finish. We can install previously purchased faucets or help you with this decision-making process. If you are uncertain about what type of faucets you wish to have installed in your home, we can provide you with recommendations for which types of faucets will work best for your current situation. We provide you with all the information you need to make an informed decision regarding which kitchen and bathroom faucets work and look best in your home. Even if a kitchen or bathroom faucet is properly installed, problems will happen at some point. Over time the sealant may fail, the handles may come loose, or the O-ring may become worn. When this happens, HEB Plumbing & Sprinkler repair services can help. Our professional plumbers will be able to assess the situation, determine the problem, and repair it, all in a timely manner. Don’t wait to have a faucet problem repaired. Call us today and let us repair, install, or replace your bathroom or kitchen faucets.